The immune system control mechanisms sometimes malfunction resulting in undesirable immune responses such as allergies and autoimmune diseases. The current therapies used to treat such responses induce non-specific suppression of the immune system, which poses the patient at an increased risk for infections and cancers. 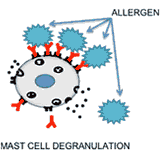 As an alternative to the current therapies, we are developing heterobivalent ligands to specifically target and inhibit the allergy causing IgEs, or auto-antibodies. With this approach we aim to selectively suppress an allergic response, or an autoimmune response without the overall suppression of the immune system. Click here to support our efforts fighting food allergy. Nanotechnology has been recognized by the NCI as a paradigm-changing opportunity with the potential to make significant breakthroughs in cancer diagnosis and therapy. Micellar nanoparticles present particularly attractive scaffolds for multivalent display as they can be designed to have multiple functional groups on their surfaces to present targeting peptides and drug conjugates simultaneously. Currently, we are engineering multifunctional micellar nanoparticles to selectively target diseased cells and overcome drug resistance in cancers, autoimmune diseases and cardiovascular diseases. Therapeutic antibodies rely on the high affinity interactions with a cell surface receptor that is overexpressed on the diseased target cell. These receptors, however, are usually also expressed on normal cells leading to non-specific toxicities. We are currently developing a targeting strategy where the selectivity of therapeutic antibodies for their target cells can be improved by delivering them as high-affinity complexes. These complexes will be engineered to target only cells with a high receptor density, thereby providing improved selectivity to the system. A major challenge of antibody therapeutics is the toxicity associated with non-selective binding to normal cells. We are currently pursuing a novel multivalency-based approach that provides improved selectivity by using "cooperativity" in multiple low affinity interactions to target diseased cells. The long term goal of this project is to increase the therapeutic index for antibody therapeutics for improved patient outcome.